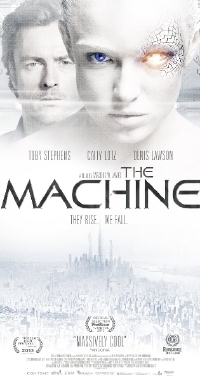 While Caradog W. James' The Machine (interview, review) arrived on VOD and theatrically a few weeks ago and though a UK home video release is already available, folks this side of the pond don't need to worry about import costs for much longer as the movie will be released on DVD and Blu-ray on June 17. To help commemorate the release we're please to announce that we've got a couple of awesome prizes to share! Two readers will take home a poster signed by the movie's star Caity Lotz while one lucky grand prize winner will get a Blu-ray copy of the movie along with an autographed poster. It's easy to enter: simply follow us and "Like" this post on Facebook and if you share it, you earn yourself a bonus entry. The contest is open until Tuesday, June 10 and is open to all US residents. Winners will be announced right here so stay tuned and good luck! Sorry! Our hands are tied. We try to be as international as possible, but sometimes we're foiled. June 12 I will be buying the Blu-Ray! The "Star Trek The Motion Picture" font!